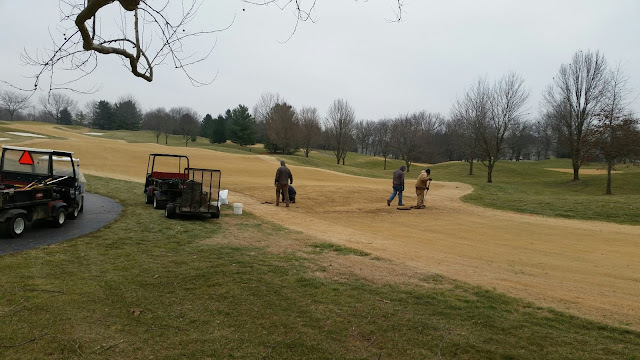 Welcome to the Highland Springs Golf Course Maintenance Blog. Looking back up #5 fairway toward the tee complex. 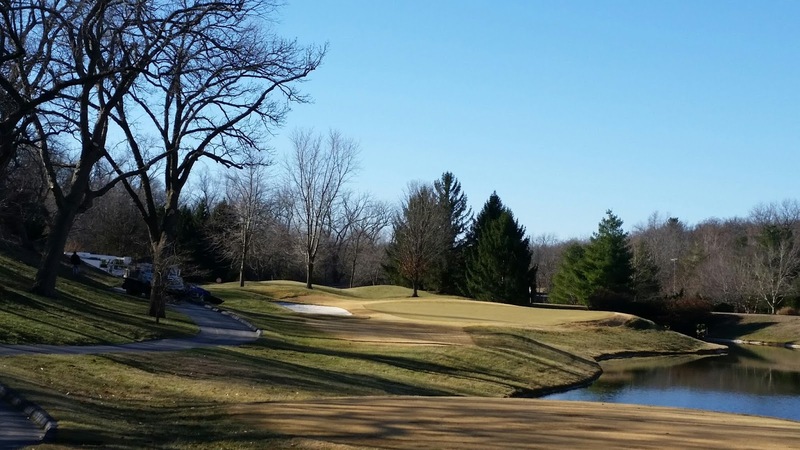 Spring has sprung and the golfing season is in full swing, yes, the pun was intended. It has been a few weeks since I last updated our blog, but fear not, we have been super busy and a few technical issues needed to be resolved on my part. As most of you know I am new to the blog world and it is a steep learning curve for me. I still have a goal of a weekly update as I get the bugs worked out. 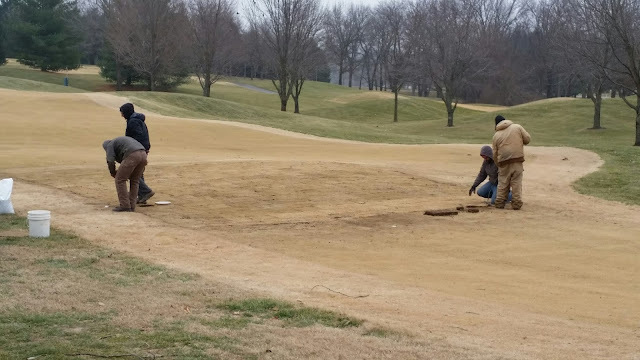 Many projects have taken place this spring in order to prepare the golf course for the upcoming season. One of the most important agronomic practices is the aeration of the greens prior to the difficult growing season. 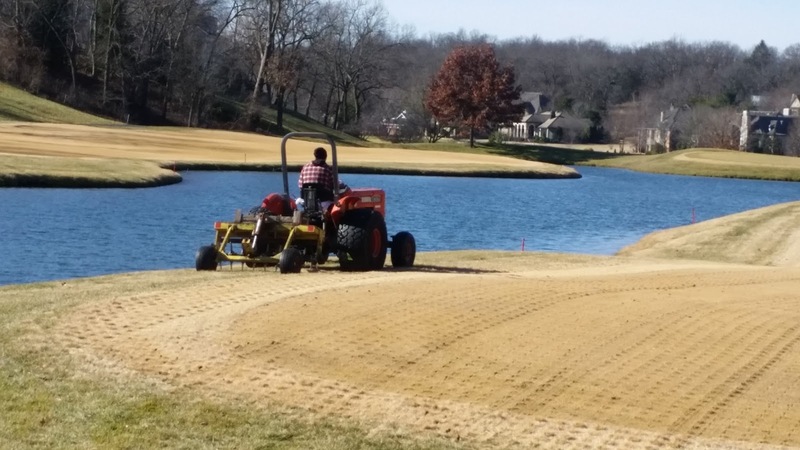 Almost every golfer has seen or heard of aeration and it is a common topic of discussion in the spring. This year we used a machine called a Verti-Drain that created a hole 5/8" in diameter and approximately 9 inches deep with a shattering effect in the root zone. This process was last preformed on the greens 7 years ago. 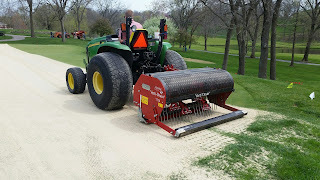 In addition to the deep tine aeration on April 3rd, we used a machine on May 23rd called the Air2g2 to accomplish the same process with minimal putting surface disruption. 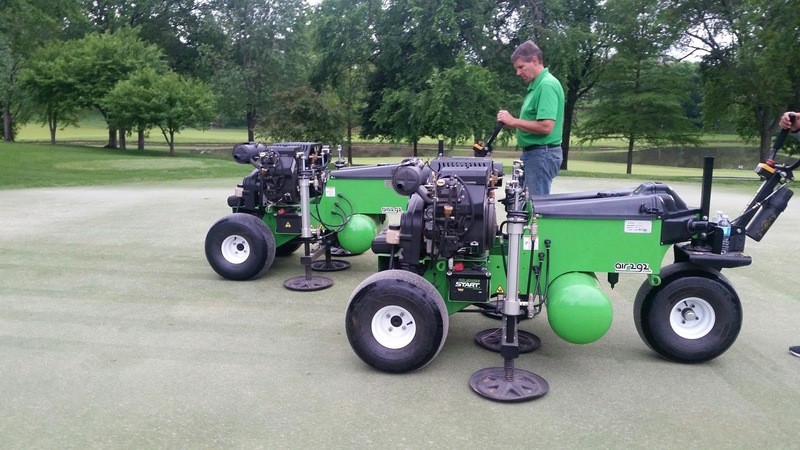 The Air2g2 uses air to fracture the root zone at a depth of 4 inches and 11-12 inches. 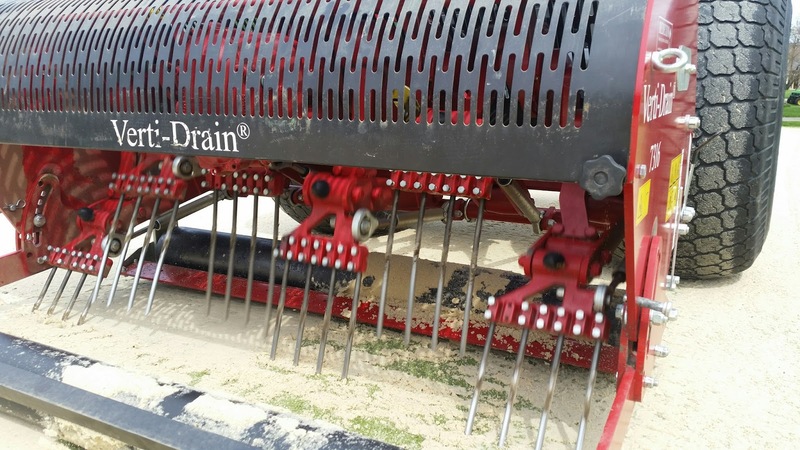 The entire aeration process is one that is designed to alleviate compaction and create pore space for air, water, nutrients and most importantly, roots. Verti-Drain and Tractor on the big putting green. April 3, 2017. Close-up of the tines we used for the Verti-Drain. Air2g2 on the Big Putting Green, May 23, 2017. I have been asked many times about the roots of the greens and why I push the roots so hard in the spring. Below is a visual reference to the growth cycle of cool-season grass. As you can see the roots have a growth cycle that is conducive to the cooler temperatures in the spring and fall of the year. It is the natural cycle of the plant to produce roots to only let them die back in times of stress. the deeper and healthier roots we have, the better chances we have of surviving an unforgiving summer. Each year is different and the weather always dictates what the plant is going to do. We just try to manipulate it in our favor. What little winter we have had is quickly coming to an end. ﻿Each winter we experience here in the Ozarks differs vastly from the previous one. This year has been no different. One of the many things a mild winter affords us, is the opportunity to accomplish projects and tasks that we normally would not be able too. In my first post last month I reported on the leveling of the Fearn teeing area in the fairways. While we still have a couple left to level there are many projects going on simultaneously. As you can see in the two pictures below is our tree trimming project on hole #13. Over the past two golf seasons I have received numerous comments about the Oak trees overhanging the green on #13. Fortunately the tree is not hanging over the green, but it does hinder a left to right tee shot into the green. Before trimming the Oak trees to the left of the golf car path. After trimming the Oak trees to the left of the golf car path. Now that the trees have been trimmed back and all of the dead-wood removed a left to right tee shot is more "workable". The trimming of the trees not only aided the golfer but it was very good for the tree itself. There was a large amount of dead-wood branches that needed to be removed thus allowing the tree to focus on sending its resources to the actively growing healthy branches. 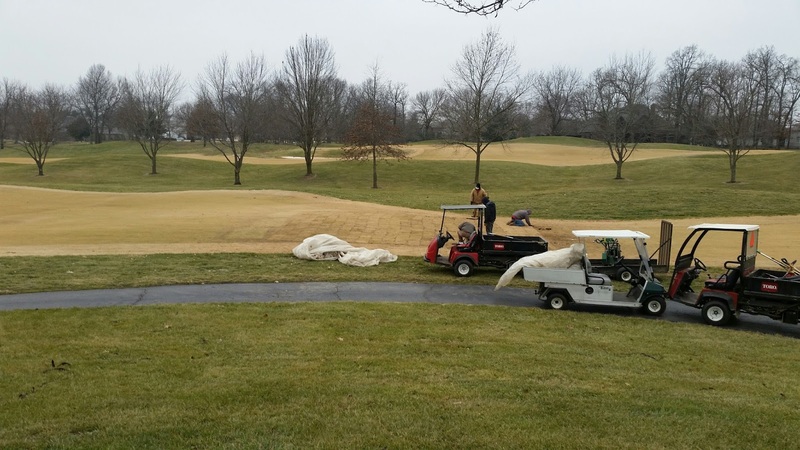 Each Winter we vent our fairways for many different reasons. Pore space in the growing medium is always good for the turf. 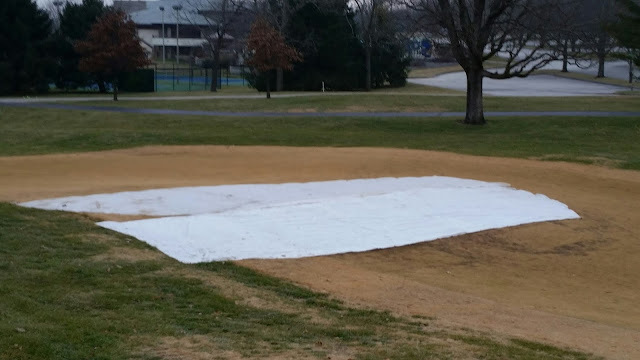 We are also wanting any winter moisture to dissipate quickly. There are many other projects that are ongoing that are in direct relationship the current weather. Check back often or even "follow" our blog. My goal is to update monthly in the winter months and weekly throughout the season. Hit it straight and I will see you on the course!! 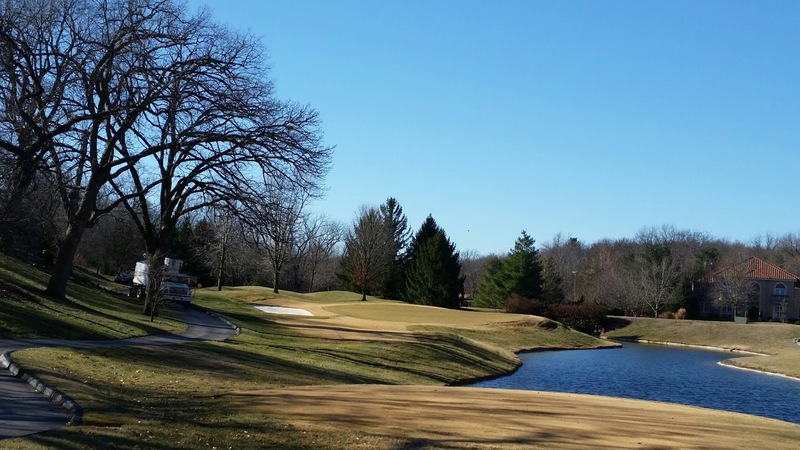 While the beautiful picture above represents what we are all looking forward to in the Spring, we still have a few weeks to go before the golf course is in that playing condition. Many things are happening here at Highland Springs during the winter months. More often than not golfers go to warmer places in the winter months and most believe we take the winters off too. Quite the contrary as this is a time of year when we are able to accomplish many goals in order to be prepared for the upcoming season. Many times I get asked; "Hey Derek, so what do you really do in the winter, just sit around and play cards all day?" Not even close. Most days are filled with weather determined tasks on the course. 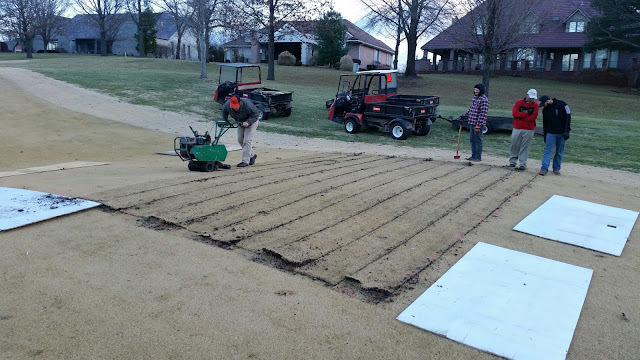 One of the many things I continually assess is the areas of improvement throughout the golf course. Some of the these areas we are able to correct in the summer months and others must wait until the winter months due to various reasons. 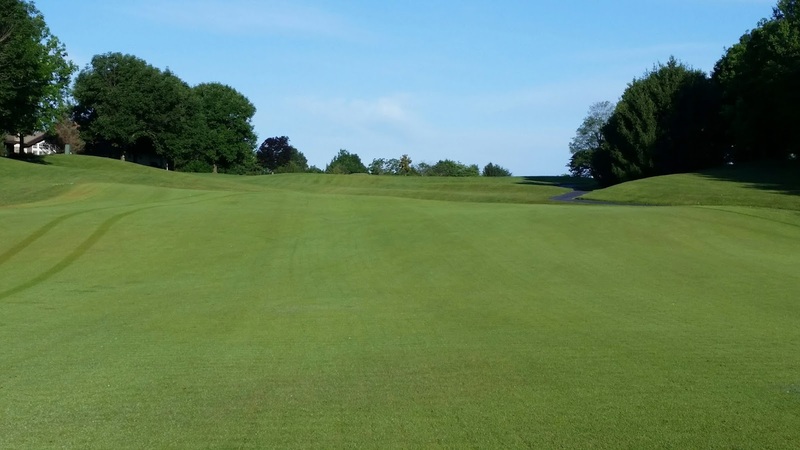 Take the 2106 season for example, we added the Fearn tees to our repertoire and in doing so six teeing areas were created at the beginning of those six specific fairways. 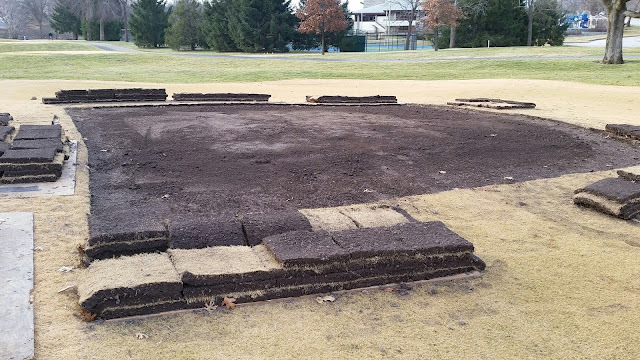 We placed temporary markers in the ground in those six locations with the plan to level a teeing area during the winter months. 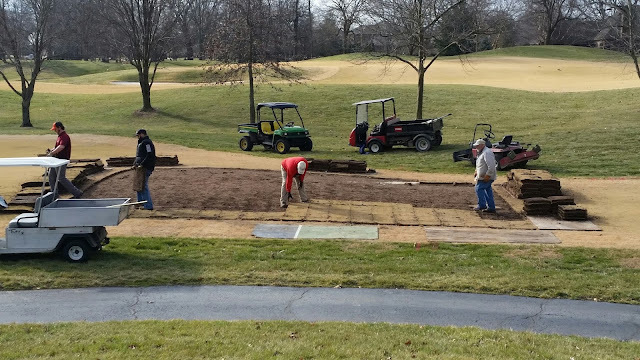 As you can see from the pictures below, this project is one that required disruption to the fairways directly with the line of play. Although we are hard headed (insert joke here), team safety is always a priority. I would like to take this opportunity to thank all the members at Highland Springs for their support. I look forward to a great 2017.